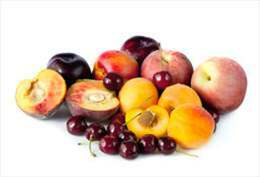 Stone fruits (peaches, plums, apricots, nectarines, and cherries) are all susceptible to brown rot caused by Monilia fructicola or the closely-related species Mon. fructigena and Mon. laxa. Brown rot colonises water-soaked spots on the fruit, which within 24 h, becomes brown enlarging and deepening, rapidly, then producing a dusting of pale brown conidia. The whole fruit may rot in 3–4 days. Transit rot, caused by Rhizopus stolonifer, is so named because it usually develops in the high humidity conditions established in boxed fruit during transport. It produces a soft rot in the fruit, which then becomes surrounded by a coarse and loose “nest” of mycelium. Growth spreads rapidly, engulfing fruit adjacent to the originally infected one, and sometimes all the fruits in a box, in only 2–3 days. Befresh™ SF antifungal culture is specially designed to inhibit fungal rot in stone fruits.